Claudine Williams is truly an original in the history of gaming. 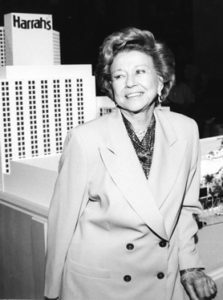 She and her husband Shelby developed the Holiday Casino, which became the foundation for Harrah’s Hotel and Casino, in the burgeoning years of the industry. After Shelby’s death, Williams continued to improve the property until she sold her interests in 1983 to the Holiday Corporation. She flourished in an unusual domain for women during the middle of the twentieth century. Her contributions to Las Vegas gaming and community life set precedents in Las Vegas history. Williams was born in DeSoto Parish, near the town of Mansfield, Louisiana. From a young age, she worked alongside her mother in a cafeteria a few hours a week. She first witnessed the excitement of games of chance a few years later and found the work she wanted to do for life. She learned everything she could about the games as fast as she could, made life-long friends with some of the masters in the Texas gambling world like Benny Binion and Jake Friedman, and met her future husband and business partner Shelby Williams. Shelby and Claudine Williams moved to Las Vegas in 1963 to pursue a business opportunity with the Silver Slipper casino. Within a few years, they turned that property around, sold it to Howard Hughes, and prepared for their next venture—building the Holiday Casino. As Shelby’s health failed, Claudine assumed more of the duties and eventually took over entirely. Respected for her knowledge of the business and for her business acumen, her transition to President and General Manger of the Holiday Casino (later Harrah’s Hotel and Casino) in 1977 went smoothly. Not only was she the first female executive of a major casino, but the first woman to serve as chair of the board of directors of a bank in the state of Nevada (American Bank of Commerce), and the first woman to serve as the President of the Las Vegas Chamber of Commerce. She served on the board of the Las Vegas Convention and Visitor Authority where she was instrumental in beginning Leadership Las Vegas. In 1992, she was honored by her peers as the first woman inductee into the Gaming Hall of Fame. One of the principles Williams lives by is “to give back to the community in which you have prospered.” Numerous organizations and Las Vegas institutions have benefited from her generosity, among them the University of Nevada, Las Vegas. She made a commitment to help advance education in the Las Vegas valley and was among a small group of residents who started the UNLV Foundation. Very few women have owned and operated a major property in the casino industry. Claudine Barbara Williams is an exception. She learned every games of chance that she could as a teenager during the Great Depression and supported her mother and sister with her wages. She operated her own club in Texas before she was twenty-one years. She worked for Benny Binion in Dallas and Jake Friedman in Houston. By the time she and her husband Shelby Williams came to Las Vegas in 1963, they knew several of the developers of the burgeoning casino industry. They developed the Silver Slipper Casino and sold it Howard Hughes. Then they bought land across Caesars Palace and developed the Holiday Casino, which is the foundation for Harrah’s Hotel and Casino today. After Shelby’s death, she continued to improve the property until selling her interests in 1983 to Holiday Corporation. Williams is truly an original, in the history of gaming. Claudine Williams: A Life in Gaming recounts her experiences in Louisiana, Texas, and Nevada literally coming of age in the world of gaming. The oral history has been edited for easy reading and includes a number of photo images from her personal collection that have never been published.